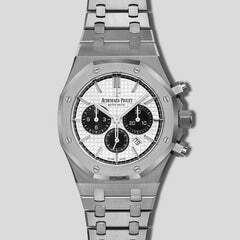 Audemars Piguet was founded in 1875, making it one of the world's oldest watch manufacturers. The Jules Audemars collection reflects the more traditional side of Haute Horology, paying respect to their esteemed history through elegant timepieces emphasizing classical styling and more intricate complications. Precision and symmetry are represented flawlessly in this Jules Audemars hand-wound minute repeater with central jumping hours. The open worked dial exposes the fascinating inner working, the movement entirely visible showing off the incredible finishing and artistry. Hand-wound Openworked Manufacture Caliber 2907. 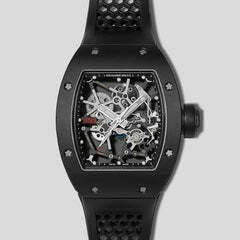 Minute repeater, jumping hours, minutes, small seconds. 43 MM platinum case, silver-toned dial, openworked, black printed Arabic numerals, blued hands, hand-stitched blue alligator strap. Airtight.